There are a few options for camping along the banks of the South Fork American River. Many of these are privately owned campgrounds that cater to the whitewater rafting community. Government parks and public lands are generally considered day use only, with a few notable exceptions in the more remote regions of the canyon. Camping along the South Fork American River on BLM (Bureau of Land Management) land is permitted at mile 12.2 on river right. This area has a bathroom facility but no potable water, and is only accessible by boat. It is recommended to purify all river water. Wilderness camping is also permitted at mile 12.8 near Gorilla Rock and at mile 15.3. There are several campgrounds along the South Fork of the American River. 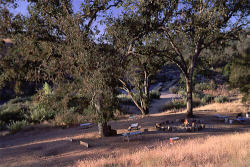 Camp Lotus, Coloma Resort, and American River Resort all have camping facilities and river access. Reservations are highly recommended.